Mother’s Day is just around the corner and Texas Fine Wine offers some fun and different ideas for pampering Mom. These wine pairings are as solid as mom and apple pie. Cheers! Celebrate Mom with a day of roses and rosé at Pedernales Cellars. The first 100 moms will be given a rose, the perfect pairing for the 2014 Pedernales Texas Dry Rosé wine (recently featured in a Reuters story about the popularity of rosé wines). This rosé just won a silver medal at The Rosé Competition held in March in California. 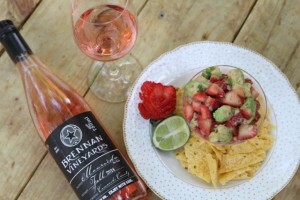 Pair the Mourvèdre Dry Rosé with strawberry-avocado salsa, or with a bunch of beautiful daisies. No cooking for mom on her special day! Head on over to Duchman Family Winery for a fabulous Mother’s Day brunch or pick up the Mother’s Day picnic pack and a bottle of the 2014 Dry Rosé and lounge under the big oak trees. This saignee rosé of Sangiovese offers bright strawberry and granny smith apple notes (better than Mom and apple pie!). Pamper mom with a little bit of sugar and spice with a special chocolate by Sweet Comfort paired with Bending Branch Winery’s Texas Tannat®, which just won silver at the prestigious 2015 TEXSOM International Wine Competition.